BGN ladies participate in a Netflix campaign and a written roundtable on representation in television. Black Girl Nerds got the awesome opportunity to collaborate with Netflix on an awesome project called #FirstTimeISawMe, detailing the first time we as Black women first saw people like ourselves in media. It was an excellent conversation, which you can watch in full, but myself, Joi, Kay-B, and Afiya expanded on our conversation in a roundtable below. We’d love to hear when you first saw yourself in media — just remember to use the hashtag #FirstTimeISawMe. When was the first time you saw yourself represented in media? Connie: I think the first time I saw myself in media was Olivia on what I call “The Huxtable Show” was the first time I saw myself represented in media. That show, of course, had a lot of representative moments for Black people, but it wasn’t just physical appearance. Despite both Raven and I both being light bright, Olivia’s relationship with Cliff mimicked my relationship with my own grandfather — he would tease, I was precocious and adorbz, we’d spend lots of time together. I feel actually pretty blessed to have seen someone so early on, there are so many people of color who don’t get that. Kay-B: The first time I saw me was similar to Connie’s response as it was on The Cosby Show. The perfect blend of comedy and drama, was the first time I saw myself truly represented well in media. Seeing Claire Huxtable be the strong, affirming, strict, intelligent, caring and loving mother was so unique and revolutionary for me. It was the first time outside of seeing my own mother that I really identified with a woman who truly had it all, but in a realistic manner on T.V. They were the first time I saw a family that looked like mine, all hues and complexions, various personalities, sibling fights over the most ridiculous things, and lessons being taught by their parents and grandparents. The Huxtables were the epitome of Black excellence, both dominating in their respective fields, finding time to maintain a healthy marriage that — while it wasn’t perfect — showed true partnership, all while raising 5 children and still spending time with their own parents. They juggled life, but their kids always knew that they were loved and a priority, even when they were being disciplined. They expected more from their children because they realized that they would need to work harder to continue to be great. That was so impactful to see because my own mother and grandparents raised me in that same vein. It was one of the first times that I saw positive and true reflections of a Black family on T.V. It was one of the first times that I didn’t see myself onscreen as a villain. Then, of course, there were shows like Martin, Living Single, and A Different World they also heavily influenced me. Living Single, in particular, showed such a different world from what I was used to. Never in a million years did I actually think I would end up living in NYC. Watching Khadijah show the realities and complexities of being a small business owner and entrepreneur and seeing Maxine be the renegade attorney and direct, uncompromising woman she was, showed me that no matter what the life we choose, Black women could own their own, hold their own, and forge their own paths in their careers and personal lives. While I was much younger than the ages of the cast in the show, it still was really positive to see these women conquering the concrete jungle with style, grace, humor, joys, and pain! Joi: My answer is actually different than Connie and Kay-B. The first time I remember seeing myself was Aisha from Mighty Morphin Power Rangers. I was about 3 or 4, and seeing a Black girl with super powers as the yellow ranger spoke to me. Afterward, Tanya became the yellow ranger in Power Rangers Turbo. In my young mind, Black girls + yellow = yellow ranger was my destiny. I dressed like the yellow ranger for 5 Halloweens in a row. My parents painted my room half yellow for me and half pink for my sister (she was my counterpart in her pink ranger gear). You couldn’t tell me my life wouldn’t end up like this. In fact, a quiet part of my heart is still expecting to suit up when the time comes. Afiya: The first time I saw me was when I started watching Living Single. Queen Latifah’s character, Khadijah James, was everything I wanted to be and then some. She was a writer, specifically a journalist. She was the publisher of her own magazine, Flava, and she was also wasn’t bad when it came to snagging her guys. While this wasn’t me at that time — as I was still a young kid when I was introduced to the show — she was who I wanted to be when I grew up, and still kind of aspire to become to this day. What I definitely did identify with, however, was the fact that she lived in a house with two other women, and they were all like a family. Growing up as an immigrant in New York City, I definitely identified with living with a tight-knit family and having to share experiences, both good and bad, and meeting people in our building whom we clicked with and became very close to and loved like family as well. Who are some current characters you relate to? Connie: I must say two: Bill Potts, the newest Doctor Who character, and Claire Temple from the Netflix Marvel-verse. Bill is more physical appearance, light skin, strong eyebrows, and big teeth and hair. Bill’s tendency for questions is really great and I aspire to be as curious as she is. Claire, in the other hand — who is Afro-Latina, she is mostly discussed as Cuban, but she is also canonically Black and I didn’t want to erase that — is also someone I aspire to be more like. She’s the center of the Netflix Marvel-verse, though I became obsessed with her character via Luke Cage. None — none! — of those superheroes would be alive if not for her! Her patience and willingness to be there for the people around her is something I relate to, but her fierceness is something I wish I had more of. Joi: Issa Rae, in every role she is in, is me from top to bottom. From Awkward Black Girl to Insecure, there’s a sincerity in her acting that you know she’s drawing from real life experiences. Awkwardness is in the DNA, I’m certain. You cannot fake it. So I appreciate Issa putting on for us dark-skinned girls who want to live in the moment and reduce the awkward. Kay-B: In my opinion, Dear White People will serve as one medium that will help push this generation to take a deeper look into themselves. Watching that show, I know I identified with not just one of the characters but several. This show brilliantly tackles and portrays the wonderfully complex and layered versions of young Black people, and specifically Black women. The fact that the show takes place on a college campus, helped me remember my college days and getting to know myself as a young Black woman. Every main character on this show is trying to determine the type of person they will be as they continue to enter into adulthood, while navigating challenging personal experiences and campus racial tension and incidents. It is wildly relatable, even for those in post-collegiate years because you can relate to the journey the characters go on and the growth you know they will gain out of every experience. Another fantastic show is Queen Sugar and its ability to tackle so many issues in our community head on. The Bordelon family is just like almost every other Black family who experiences loss and then tries to rebuild and rise from that loss. The women in this family are written so beautifully. They tackle family secrets, infidelity, wealth, building a family, prison, depression, interracial relationships, queer relationships, spirituality, the duality of being Black in America, police brutality and the corruption in the judicial system. This show is doing leaps and bounds for representing the current Black family and its many facets. I appreciate them for expanding the Black narrative and showing true human growth through the highs and lows of life. Afiya: Much like Joi, I totally identify with Issa Rae’s characters on both her online show, Misadventures of Awkward Black Girl, and Insecure. I feel there’s a certain level of kinship between Issa and I (in my mind, obviously) because her characters are rooted in being a thoughtful, well-meaning person who at the time executes things awkwardly. Also, her characters are a representation of what some young, Black females I know are struggling with today: finding themselves and their purpose. For the first time in a long time, here are female characters who don’t already have it “all together,” and are still finding their way and navigating through life as it comes to them, in hopes of figuring things out and finding that job that makes them want to wake up in the morning, or finding that man that really compliments them. To keep going with the theme of “awkward” as that is my life, Raquel from Netflix’s Crazyhead is also a character who identify with. Though I’m not British (I wish! ), or half-demon (then again, you should ask my mom about that one), Raquel has this awkward quality about her that she totally owns. She knows she’s an introvert and has a hard time making friends or being friendly with people, but she has a big heart. And she’s willing to share it and open it up to those she feels are worthy of it. She’s a protector and isn’t timid to jump into the thick of things though she knows people won’t understand her. She puts her family and friends above everything else and I definitely see a lot of her in me. Where do you think representation is going, not just for Black women, but for all marginalized communities? Is it getting better or worse? Connie: I think it’s still slow going, but it’s getting better — depending on what you watch. If you watch Netflix or ABC or even somewhat the CW, you may see someone who looks like you (but maybe not as a lead character). But if you watch a network like CBS, you probably won’t — no matter who you are. But one thing we’ve noticed in entertainment specifically speaking about Blackness, is that dark-skinned Black women are finally allowed to flourish more. From Michaela Coel on Chewing Gum to Lashana Lynch of Still Star-Crossed, Black women with beautiful brown skin are being given the opportunity to be funny, be loved, be vulnerable, be Emmy winners (here’s looking at you Uzo Aduba and Viola Davis!). As a light-skinned person, I recognize that I’ve been able to find more representation than my darker-skinned friends. So I feel happy they’re able to be increasingly represented. It’s not perfect, and colorist casting is still a thing, but I hope forward movement continues. Joi: I completely agree with Connie’s point about finding representation easier than her darker skinned friends. In the comic book live adaptations, we have a ways to go with making sure we have representation of ALL skin tones. Why I love Issa (and Viola! + others) so much is because their hue shines through in every film they are in. And I can see that and be inspired, even if I am not in the acting business. As for marginalized communities, we also have a ways to go with disabled, Asian, Indigenous and Latinx representation. All I can do is be hopeful that it will change. Kay-B: Agreed on Connie and Joi’s point, it is so refreshing to see all of us, in our many shades and body types, finally seeing the light of day in media. I think we have come along way, but we still have a long way to go. I think just now it is starting to be “ok” to have a beautiful, brilliant, and bold dark-skinned Black woman be the lead on a show and be in a romantic relationship with whoever she chooses. I am specifically thinking of How To Get Away With Murder. As problematic as Annalise is in terms of what side of the law she is really on, we are just now seeing a powerful Black woman be desired by men and women! Annalise is someone is who is unapologetic in her sexuality, in her career, and in who she is! Of course, other shows that show really strong, thoughtful depictions of multi-faceted Black women and women of color, Orange is the New Black, American Koko, Luke Cage, even the depiction of Iris West and the West family on The Flash. I think in terms of Asian representation in media, we still have a lot of work to do. Afiya: I agree as well. Colorism amongst Black Women on TV and Film has been an issue long before I was alive to watch TV, but it definitely started to shift in the ‘90s when you had shows like Moesha or even The Parkers where we were getting some brown-skinned ladies of different shapes in the lead roles. Since then, however, a number of Black women — despite their shade — started to wane on TV, especially in lead roles and that to me was a greater issue. Thankfully, I do feel like there is a re-emergence of Black Women on television and there’s been a greater emphasis on the variety of women (so to speak) that we see. You have the beautiful shades of the women of Orange Is the New Black, the lovely complexions on Chewing Gum, and let’s not forget the ladies of Shondaland’s How to Get Away With Murder and Scandal. Despite their somewhat problematic story arcs, it’s awesome to see these Black women resurfacing on TV. In the ‘90s and early 2000s, there was a slew of shows that spoke to the Black audience: Fresh Prince of Bel-Air, Family Matters, Martin, Living Single, A Different World, and when they went off the air, it seemed like people just forgot there was an audience out there seeking entertainment… and then we kind of got stuck with the reality TV stuff while everyone else was getting quality dramas and comedies. So it’s my hope that it continues and they continue to flourish instead of being a trend that eventually goes out of style. And I know I’m being greedy, but it’s also my hope to see some roles expanded to the whole Black diaspora (since Black women aren’t just African-American) and even in more Science Fiction/Fantasy properties, too. I can only recall two Black female vampires in True Blood’s seven-season run and, considering that the show was based on in Louisiana, they could’ve done way better. Who are some voices (networks or shows or show runner/creatives) out there who are doing the work? Connie: I think ABC is going a great job in providing shows that speak to marginalized voices. From blackish to Fresh off the Boat and Speechless and, of course, all of Shondaland. It is one of the networks that provides the widest range of voices, in my opinion. Netflix, similarly, has made me proud with just this campaign alone. A network that has been increasingly providing work from Black creatives or starring Black leads is actually reaching out to speak to Black media outlets and fans to hear what we think about representation and uplifting our voice. That’s commitment to engaging with your audience and I’m glad to have been apart of this project. I hope to see a project similar to this featuring other typically marginalized communities because it is so important to let your audiences know you are listening and that you value their voices. Joi: To me, Ava DuVernay is doing great work. What I love the most about her is she has her hands in a lot of pots but is not burning herself. Her film success with Selma and the upcoming A Wrinkle In Time. Her creation of Queen Sugar on OWN. 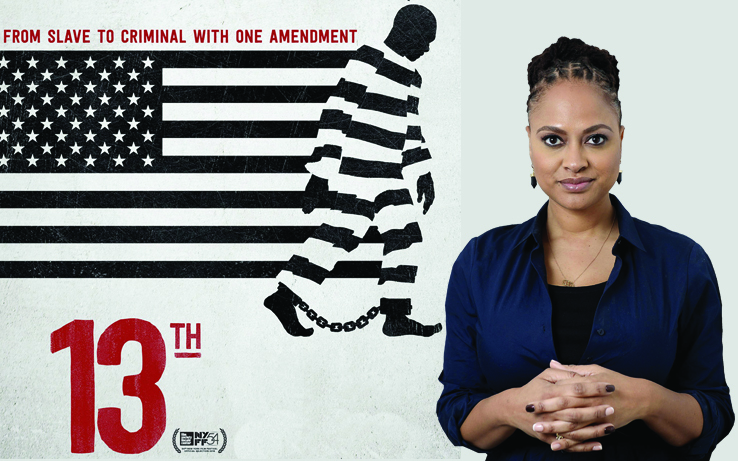 And her relationship with Netflix to produce 13TH and the upcoming Central Park Five Series. At the center of her stories is some facet of Blackness, and I think we all appreciate that. Kay-B: I think a lot of creatives are doing a lot of good work. Mara Brock Akil & Salim Akil have been pushing out relatable content and shows since Girlfriends, which was such a dynamic series during its run. I am excited to see what they do with Black Lightning this Winter. Ava DuVernay and Queen Sugar and just having all women directors at the helm of each episode, is visually stunning and definitely revolutionary. The show is brilliantly written, directed and shot. It keeps pushing television. Shonda Rhimes was one of the first black women to get the opportunity to create original content on ABC and continues to create more and more roles for women, people of color and marginalized communities. Black-ish in a lot of ways will be my nieces’ new age version of the Cosby Show, with their unique blend of family drama, mixed with comedy, all while tackling current events. Lastly, I think Jerrod Carmichael had something outstanding with the Carmichael Show. I think he was able to show a different side of the American Black family, generationally differences, trying to open up your parents or grandparents mind to change, while addressing things that we are facing as a nation and a people today. Afiya: To mirror the ladies before me, definitely Mara Brock Akil, who gave us Girlfriends and Being Mary Jane and now Black Lightning, has been instrumental in the past few years of bringing back powerful yet flawed (aka human) Black women to TV. ABC has been doing an amazing job with Shonda Rhimes’ shows that feature Black women in prominent (albeit troublesome) roles and the “new” The Cosby Show aka Black-ish. And I hate to admit it, but Tyler Perry has also made a point pushing for the African American experience on TV with his slew of shows on TBS and OWN — OWN’s Perry-less contributions, like Queen Sugar and Greenleaf are also doing a great job of bringing good, quality drama with brown bodies that viewers can relate to. Many thanks to Kay-B, Afiya, and Joi for trekking to Queens, being awesome and eloquent and making the BGN team proud, and TONS of thanks to the team from Netflix who helped make this happen! Previous articleBGN sits down with DETROIT’s Jason Mitchell, Leon Thomas III, and Nathan Davis Jr.